Why do you hate that Fruit? So, I was in the market yesterday to return an unripe watermelon that my fruit guy sold me some days ago. (Yes o, I return unripe or bad fruits to him) I cut the thing open 2 nights ago to have some for dinner, lo and behold, it was white inside!! He always asks me to return, the fruits if they turned out bad. He gave me another huge water melon, and dashed me some carrots by the side as compensation. He even wanted to add cucumber but I refused, I felt bad. Only for me to look back and sight the fresh looking Irish potatoes on table, choi! I almost asked him to give me those instead, but fear no gree me, hahahaha! Make d guy no abuse my generations. Lol! Anyways, I made him cut open the fruit this time, because I couldn't risk coming again. It was perfect! 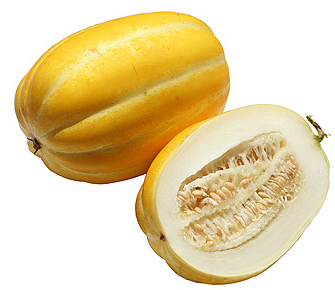 Its called 'Golden melon'. I don’t like the taste, the smell....yuck!! I think its from childhood. It got me thinking, why some people hate certain fruits? Anyways, please tell me, what fruit or fruits do you dislike/hate? Why and for what reason? Give us details please. Lets have fun with this. Take care and God bless. Hiya Cheliz mami hope ur good. I didn't work out today, why? Erm lemme see... abeg baby no gree me jare that rugrat wears me out but maybe I'll make up in the evening. Fruit I hate... can't think of any right now maybe I'll come back if I remember. Lol! Please try o, no excuses k. Kisses to baby. Thanks Ronke. try dear, every little effort must show, its not a waste. Ah you hate pineapples ke? Me and you go fight o.
Hahahaha! DA doesnt like pawpaw?! Please come and share your home made body scrub with me, i need my skin to be glowing like yours.....Thanks for the love suga! Hahahahahahahahaha! Abeg send it sharply, i cant wait! Cheliz I salute you. I look forward to your post everyday. I currently weigh 110kg and ehnn I have been working out every morning and night since I started reading ur blog. I skipped bout 200 every day and do squats 20 and for the green tea wth lemon and honey,its pure heaven for me. God bless u for me. I eat any fruit so long as it's edible am game. I used to hate water melon for no reason at all until one day my dad told Me a trial will convince Me to love it. I tasted it casually and bingo I loved it and finished the whole bowl! Now water melon is my to go fruit. Now to the fruit I don't think I will ever love..."AVOCADO PEAR"
lol@salt and spoon! I love avocado...yum! I dislike watermelon!!! I can only take it when I use for smoothie mixed with other fruits.. But to eat it whole? Naaaah never... Dt golden lemon fruit.. Is dt cocoa?... Thot that's what it's called. Or they look alike.. Asides watermelon, every other fruit is fine by me.